Currently there are only two prognostic models in patients with metastatic hormone-naive prostate cancer (mHNPC) with only limited performance and some important limitations. We aim to develop a pragmatic prognostic model to guide early management in a daily-practice cohort of patients with newly diagnosed mHNPC. Since 2014, 117 patients with newly diagnosed mHNPC and ECOG performance status of maximum 2 were prospectively registered. Statistical analysis was performed using SPSS 25.0™ with two sided p-value < 0.05 indicating statistical significance. Univariate and multivariate cox regression analyses were performed to identify prognostic risk factors. Kaplan-Meier method with log-rank statistics was constructed to analyze the difference in survival in the prognostic groups. Model performance was assessed by using receiver operating characteristic (ROC) curves calculating area under the curve (AUC). These analyses were performed for both the CRPC-free survival (CRPC-FS) and overall survival (OS). Multivariate analysis identified ECOG performance status of 2 (p = 0.028) and abnormal alkaline phosphatase (ALP) (p < 0.001) as independent prognostic risk factors for shorter CRPC-FS. For OS, independant prognostic risk factors were high-volume mHNPC (p = 0.019) and abnormal ALP (p = 0.050). Three prognostic groups were created for both CRPC-FS and OS: a good (no risk factors), intermediate (1 risk factor) and poor prognosis group (2 risk factors). The median CRPC-FS for the good, intermediate and poor prognosis were 43, 11 and 6 months (p < 0.001) with 5-year CRPC-FS estimates of 20%, 6% and 0%, respectively (Figure 1.A). The median OS for the good, intermediate and poor prognosis were not reached, 73 and 23 months (p < 0.001) with 5-year OS estimates of 96%, 68% and 13%, respectively (Figure 1.B). The AUC was 0.80 (95% CI: 0.67-0.93, p < 0.001) and 0.79 (95% CI: 0.64-0.94, p = 0.003) for CRPC-FS and OS, respectively. Median follow-up was 19 months (IQR 8-34 months). 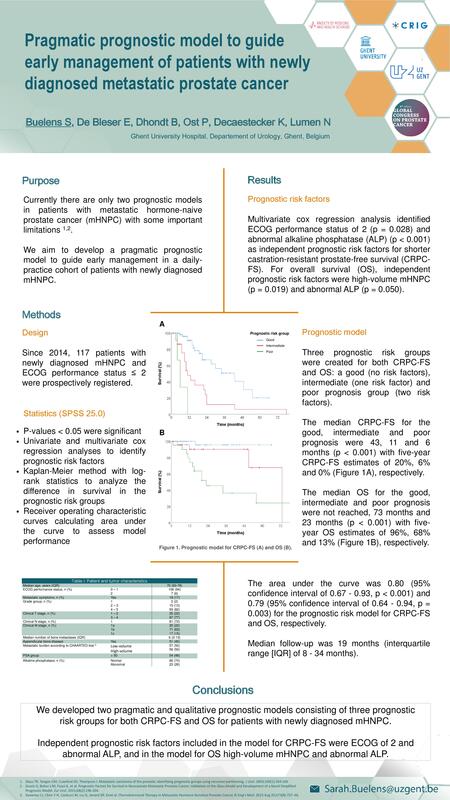 We developed a pragmatic and qualitative prognostic model consisting of three prognostic risk group for both CRPC-FS and OS to guide early management in a daily-practice cohort of patients with mHNPC. Independent prognostic risk factors included in the model for CRPC-FS were lower ECOG and abnormal ALP, in the model for OS these were high-volume mHNPC and abnormal ALP.